We have been told that the Environmental Review Process is objective and fair. Not true. It’s a great big “pants-on-fire” fib. Here’s why. The Vancouver Sun's editorial about streamlining environmental reviews comes across as boosterism for industrial growth at all costs. Mineral exploration is exploding in B.C., but critics claim the provincial government isn’t assessing the environmental impact. The public is being discouraged from commenting on Compliance Coal Corporation's proposed Raven Coal Mine Project, CoalWatch Comox Valley said Monday. A local group campaigning against the proposed Raven Underground Coal Mine project is calling for more time to review the project, ahead of a new public comment period beginning today. Critics of a proposed coal mine project say the average person would "throw up their hands" at the barriers regarding learning if their opinion has been heard. CoalWatch Comox Valley has slammed the recently announced public comment period on the proposed Raven Coal Mine Project, calling Compliance Coal Corporation’s responses in the latest version of the tracking table, vague, evasive, and anything but transparent. A further pitch is being made to toughen up the forthcoming environmental assessment for the proposed Raven coalmine near Fanny Bay. Despite being in its area, Comox Valley Regional District legally has no say on whether the mine is eventually approved or not. November 15-29, 2011: The BC EAO is requesting comments from the public on Compliance Coal Corporation's responses, as listed in the tracking table. The tracking table contains Compliance Coal Corp's responses to comments provided by the public during the May 18, 2011 to June 27, 2011 public comment period. - include permission to post your name and location with your comment, otherwise it will be posted as "personal information withheld"
The Raven Underground Coal project will not go to a joint federal-provincial review panel, the federal and provincial government said. The wide-ranging environmental assessment process regarding the proposed Raven Underground Coal Project is about to enter another critical phase where public comment is invited. Canadian Environmental Assessment Agency spokesperson Maxine Leger-Haskell explained the B.C. Environmental Assessment Office will open a second two-week public comment period "very soon," although dates have not been released. The first public comment period, held over May and June of this year, elicited comments and concerns from hundreds of area residents. Opponents of plans for a Comox Valley coal mine are worried the proposal will not get adequate scrutiny following possible budget and staff cutbacks at the federal Environmental Assessment Agency and monitoring problems at the provincial level. Will 'Super, natural B.C.' be here for your kids? The province's auditor general has highlighted the need for improvement in the monitoring of environmental assessment projects and much more due diligence. Elizabeth May discusses environmental assessments with host Jo-Anne Roberts on CBC's All Points West. She gives an informed context to and criticism of funding cuts of up to 50% for the Canadian Environmental Assessment Agency which were announced on July 20, and the recent report issued by BC's Auditor General which was harshly critical of the BC Environmental Assessment Office for all but abrogating its duty to monitor and inspect projects which have received approval. (Smithers) A new independent report commissioned by the Smithers-based Northwest Institute (NWI) has found serious flaws in the provincial environmental assessment of Taseko Minesʼ proposed Prosperity Mine in B.C.ʼs west Chilcotin region. 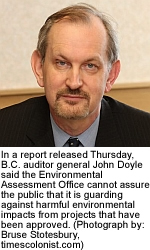 CoalWatch Comox Valley’s chairperson John Snyder agrees with B.C’s Auditor General John Doyle that the B.C. Environmental Assesment Office’s (BCEAO) is not doing a good enough job in protecting our environment. Local environmentalists are critical of the provincial Environmental Assessment Office, which is one of the bodies looking at approving the Raven coal mine proposed for Buckley Bay. CBC Almanac's Mark Forsyth talks with Auditor General John Doyle and UVic's Environmental Law Centre's Calvin Sandborn about the Auditor General's critical report entitled An Audit of the Environmental Assessment Office's Oversight of Certified Projects, July 8, 2011. Host Also, Mark Forsyth makes reference to other reports which echoed the Auditor General's concerns with the Environmental Assessment Office monitoring and assessment. 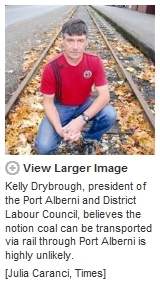 One is the Forest Practices Board's report entitled Forest Resources and the Toba Montrose Creek Hydroelectric Project. The complainants were Friends of Bute Inlet and Sierra Club of BC. The lack of followup at the Environmental Assessment Office cited by the province's auditor general is only half the story. The other problem with the office is the astonishing duplication of effort with the federal government, which maintains an identical office that does the identical job. British Columbians count on the government to protect the environment when big developments - mines, resorts, power projects and the like - are proposed. And the government has maintained that its process is rigorous and effective. A public office entrusted with monitoring environmental compliance in multi-billion-dollar industrial projects around the province is not doing its job, a scathing report by the Auditor General of B.C. said Thursday. B.C. 's Environmental Assessment Office is failing to adequately monitor major projects such as mines, power plants and tourist resorts, says B.C. auditor general John Doyle. In a highly critical report, released Thursday, Doyle said the EAO, which is supposed to provide oversight of major projects, cannot assure the public that it is guarding against harmful environmental impacts from projects that have been approved. A provincial watchdog agency that oversees projects such as dams, mines and power plants is not doing enough to monitor and regulate projects it has approved, says a report by British Columbia Auditor-General John Doyle. The Environmental Assessment Office has a lot of work ahead of it, posting the more than 2,500 public comments on Raven Underground's proposed coal mine project, slated for Fanny Bay. There are still comments coming in that have been post-dated June 30 due to the postal strike, CoalWatch's John Snyder said.